HUNTSVILLE, Ala.--(BUSINESS WIRE)-- ADTRAN® , Inc., (NASDAQ: ADTN), the leading provider of next-generation open networking solutions, today announced it is partnering with Holston Electric Cooperative (HEC) and solutions provider FiberRise to create a utility-grade Gigabit broadband network across the entire HEC cooperative membership in the Tennessee Valley. Together these companies will establish a broadband infrastructure that will connect the entire community to the world while attracting industry and improving educational opportunities, healthcare and overall quality of life. The Rural Electrification Act of 1936 promised citizens of rural communities “a fair chance” in the pursuit of opportunity by bringing electricity to these remote areas. Visionary leaders of electric cooperatives view broadband as equally compelling in delivering the same fair chance to their communities. Today, HEC is among those electric cooperatives leading the charge to deliver broadband, a resource of immeasurable value in today’s always-on, cloud-centric world. HEC partnered with FiberRise to build its broadband network. FiberRise provided a comprehensive implementation plan to support the deployment, ensuring reach and advanced service delivery to customers throughout a service area encompassing 25,000 residential and 5,500 commercial and industrial members. 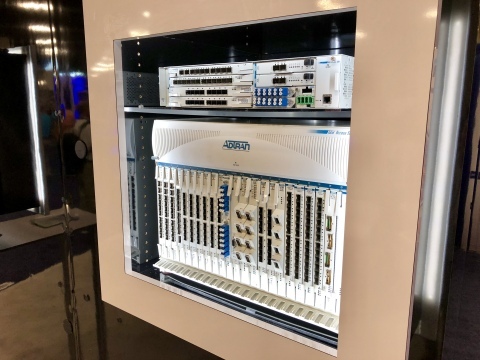 Using ADTRAN’s Total Access 5000 Gigabit services platform with Ethernet Transport Optical Switch (ETOS-10) and GPON, the HolstonConnect network is establishing a long-term, multi-gigabit fiber access solution built on an open, scalable architecture that provides the reliability and flexibility demanded of a modern telecommunications network. FiberRise, LLC enables electric utilities to implement and maintain fiber infrastructure with complete business visibility and simplicity in the delivery of broadband services. FiberRise serves electrical cooperatives and investor-owned utilities with the service and support needed to manage fiber projects from inception to operation. FiberRise focuses on quality of life by helping to make broadband affordable and accessible to all.